FCDEV3B (stands for "FreeCalypso development board, triband") is a GSM mobile station development board by FreeCalypso project. 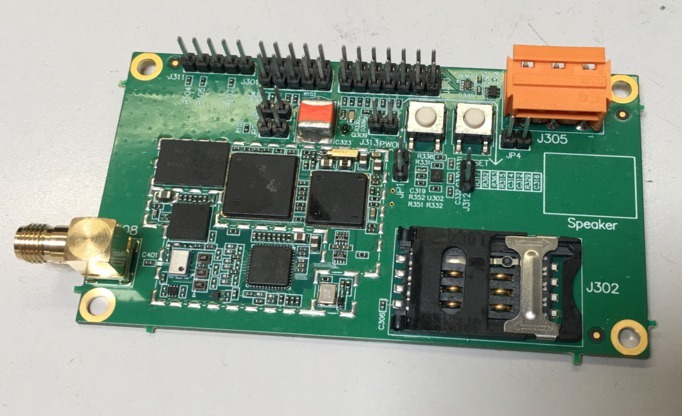 The board features the same legendary TI Calypso GSM MS chipset that was used in commercial GSM/GPRS modems such as Openmoko's, and functions as a standalone (or "bare") GSM modem. For more information, please see the project's web side https://www.freecalypso.org/fcdev3b.html. Physical: a 90x50 mm circuit board, meant to be used bare on a lab bench. Chipset: the legendary Calypso, specifically PD751992AGHH (C035, DSP ROM version 3606, full 512 KiB of internal SRAM), TWL3025 Iota ABB, TRF6151C Rita RF, Spansion S71PL129NC0 MCP for 16 MiB of flash and 8 MiB of external RAM. External interfaces: power input connector, headers for two UARTs, JTAG and MCSI (Calypso DSP auxiliary interface) at 2.8V logic levels, SMA connector for the antenna or RF test equipment. The primary means of programming, controlling and interfacing with this GSM modem board is serial on two UARTs. Natively the board presents only LVTTL UART interfaces. On-board peripherals: SIM socket, power-on and reset pushbuttons, connections for a loudspeaker and a microphone for exercising voice calls. Radio: the standard version is 900/1800/1900 MHz triband. At the moment, this hardware is not natively supported by OsmocomBB. Please see https://osmocom.org/issues/3581 for more details.